Medicare can be confusing... get help from a real person today. When Am I Eligible for Medicare in Florida? Most people are eligible for Florida’s Medicare plans once they turn sixty-five years of age or older, but younger people with disabilities like Amyotrophic Lateral Sclerosis (ALS), as well as those suffering from End Stage Renal Disease, are also eligible. To make things simpler for you, Medicare.gov developed a calculator to determine both your current eligibility and the premium you can roughly expect to pay for standard Medicare coverage. How Do I Apply for Florida Medicare Plans? Luckily, applying for Medicare in Florida is the same process as any other state. It’s a general rule that qualifying for Medicare means you’re either a US citizen or you’ve been a legal permanent resident of the US for at least five consecutive years. Residents of the Sunshine State can actively enroll in Medicare a few months before their sixty-fifth birthday. If you’re a Florida resident who’s already receiving benefits from the Social Security Administration (SSA) or the Railroad Retirement Board (RRB), you’ll typically be enrolled in Medicare automatically. If you’re a healthy US citizen (or you meet the lawful presence and residency requirements), you can sign up for Medicare in Florida during the Initial Enrollment Period, which starts three months before your sixty-fifth birthday and ends three months after the month you turn sixty-five. Others may be enrolled sooner if they receive Social Security disability benefits or certain disability benefits from the RBB for more than twenty-four consecutive months. If you have to apply for Medicare coverage manually (like individuals with End Stage Renal Disease), you can visit your local SSA office or enroll over the phone or online. Find your local SSA office so you can pay them a visit. It’s typically best to schedule an appointment in advance. Call Social Security at 1-800-772-1213 (TTY users can call 1-800-325-0778), Monday through Friday, from 7 a.m. to 7 p.m.
You’re at least sixty-four years and nine months old. You don’t currently have any Medicare insurance. You don’t want to start receiving Social Security benefits at the moment. You aren’t currently receiving Social Security retirement, disability, or survivors benefits. Medicare Parts A and B (or “Original Medicare”) represent the foundation upon which Medicare plans are built. Inpatient care services are covered by Part A, which is hospital insurance. Outpatient care and durable medical equipment are covered by Part B, which is medical insurance. 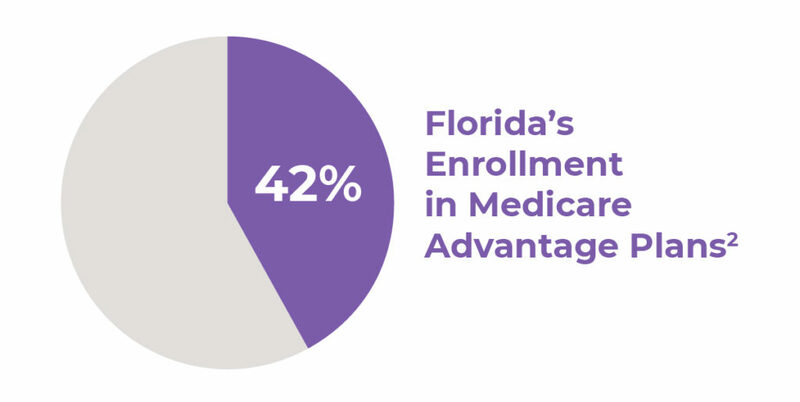 Florida has the third-highest enrollment in Original Medicare in the country. If you want to learn more details about Original Medicare, check out our Medicare 101 page. A Medicare Advantage plan allows the policyholder to choose a private insurer (must be Medicare-approved) from which they receive all of their health-related services. Also known as Medicare Part C, this type of plan includes everything covered by Medicare Parts A and B and may also include additional benefits, like prescription drug coverage, chiropractic care, and vision, dental, and hearing coverage. Medigap coverage is designed to cover the “gap” between the 80% that’s covered by Original Medicare and the remaining 20% that the beneficiary is responsible for. Also known as Medicare Supplement Insurance, Medigap pays for specific out-of-pocket costs that aren’t covered by Parts A and B, like copayments and deductibles. This type of plan is exclusively for beneficiaries who carry Original Medicare (Parts A and B)—you can’t have Medicare Part C (Medicare Advantage) and also carry a Medigap plan. There are a handful of different types of Medigap policies, depending on your needs, your budget, and your lifestyle. Savings programs for Medicare in Florida: For individuals whose income falls below a certain amount, there are several savings programs to help pay for out-of-pocket costs like copayments and deductibles. There are also Florida Medicare programs that help with prescription drug costs for low-income residents. The Florida Department of Elder Affairs’ SHINE program: SHINE (Serving Health Insurance Needs of Elders) was designed to help Florida Medicare beneficiaries with the complexities of insurance. The free program provides one-on-one counseling with specially trained volunteers to help answer questions surrounding Medicare and other health insurance–related queries. The complex world of Medicare (and health insurance in general) can throw a lot of people for a loop. But fret not—there are plenty of licensed Medicare agents in Florida to help answer any questions you may have and help you secure Medicare insurance that feels right for you. Schedule a consultation with a licensed Medicare agent in your area to get the best coverage for your individual situation.